Checking the Traffic Viewer confirms that the test is getting the ID value and making a successful call to the service. But this error causes the test to fail just about every time. Is this a known issue? Have you tried updating your test execution to run your tests as a group? This will allow the dataSource to be iterated once per group. The option can be found in your top level test suite >Test Execution > Test Relationship. In other words, the Data Bank must actually be executed and the XPath used for the extraction must actually matched something. For example, if you open up your tst and run the REST Client then it will guarantee to fail. You should run the scenario containing both tools. 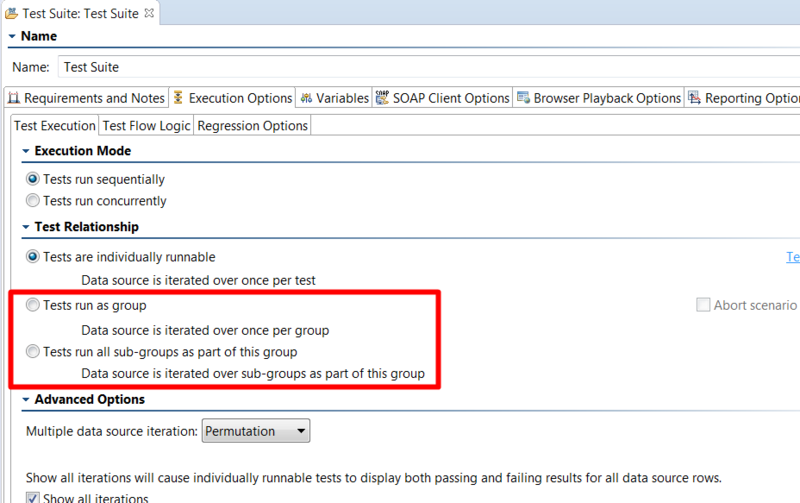 When a data bank is present, the suite should automatically be configured for "Tests run as group". Even so, for convenience, the UI will let you manually run the tests one at a time (individually) but the Data Bank column won't be found unless you first run it before any other tests that depend on it. Double check your XPath to make sure it is actually matching on what you expect. Hello. Thanks for your responses. Yes, I have the test configured to Run as Group. And I am running the DBTool first to populate the Data Bank. Like I said, the test is successfully getting the Id from the DBTool and hitting the service with it. In this case, the error message is wrong. There is a correlationId in the Data Bank. The test should pass, but due to this error, it is failing. The data bank will be found if the the XPath for your "correlationId" column actually matched. Checking the traffic viewer is not sufficient to know whether the XPath is matching or not. One way to check this is to run the Data Bank once, open the Data Bank editor then select the extraction and click Modify, then click the Evaluate XPath button. Doing so will displays the result of applying the XPath expression against the expected XML, letting you know if it is matching or not. If you are still seeing unexpected behavior then you may want to contact Parasoft support. The Data Bank and REST Client are definitely not broken in any way like this. Not sure what else you might be missing. I am getting "No Data source column Named" Error even after running the DATA BANK and then extracting values. I observed that for only few columns of DATA BANK getting this error. These column values are NULL and when tried Evaluate XPATH getting output as " No nodes Found". Is there any way to add such columns with NULL data ? Thanks Thomas, i am able to extract the values with selecting the fields you mentioned without error:).